This is the season for garden visiting and so it has been for me in July. 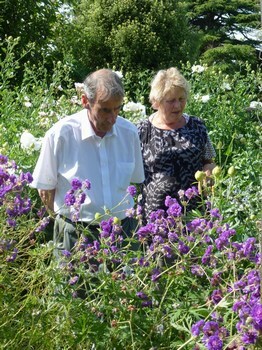 The range has been from a local HPS member’s garden to those of professional gardeners and a garden restoration project. Each garden displays the personality of the gardener and even where the structure is an inherited one, the planting is a significant clue. I have had a trip to Ireland to visit aging relatives but also to visit gardens and buy plants. For a long time I have intended to visit Helen Dillon in Dublin. Helen is an HPS member and her garden can be seen at www.dillongarden.com. I was interested to see the canal in her garden as I had heard her talk of it and to see it in the context of a suburban garden with her choice of plants. At Helen’s suggestion I visited Carmel Duignan near Bray. This is a sheltered garden near the sea with many half hardy plants. Carmel is a knowledgeable plants-woman and I came away with a bag of cuttings, now safely potted up. Then it was on to see June Blake in County Wicklow. I was interested to meet June as I have a pale yellow Aqueligia that has her name attached. It is a delightful plant and so far has come true from seed with me. In Northern Ireland I was staying with my cousin Helen who is both an artist and a gardener. This is apparent in both the design and planting of her garden. She has created shelter, in an otherwise fairly exposed garden, by building walls that reflect the gentle curves of the local drumlin landscape. These are glacial landforms rather like inverted spoons. The planting colours and forms give the overall impression of brush strokes of paint in the borders, especially in the evening light. I was drawn to the “picture” time after time. It wasn’t just the way the garden was set in its landscape, the way it was framed by the walls, trees and sky or the chosen plants and their arrangement – it was a sum of the whole. Thinking back over all the gardens I had seen during the week (and there were 3 others in addition to the ones mentioned above and another 2 this week) the least satisfying ones for me were those where the plants dominated over the place. Now I am back at home and looking at my own garden with a more critical eye. Posted on August 3, 2012, in News 2012 and tagged helen dillon. Bookmark the permalink. Leave a comment.